German-born theoretical physicist and Nobel Prize laureate, Albert Einstein was born this day March 14th, 1879 in Ulm, in the Kingdom of Württemberg in the German Empire. He is Often regarded as the father of modern physics and was one of the most prolific intellects in human history, and is best known for developing the theory of general relativity, E = mc2, which was revolutionary in physics. For this achievement he receiv ed the 1921 Nobel Prize in Physics “for his services to theoretical physics, and especially for his discovery of the law of the photoelectric effect”. The latter being pivotal in establishing quantum theory within physics. Near the beginning of his career, Einstein thought that Newtonian mechanics was no longer enough to reconcile the laws of classical mechanics with the laws of the electromagnetic field. This led to the development of his special theory of relativity. He realized, however, that the principle of relativity could also be extended to gravitational fields, and with his subsequent theory of gravitation in 1916, he published a paper on the general theory of relativity. He continued to deal with problems of statistical mechanics and quantum theory, which led to his explanations of particle theory and the motion of molecules. He also investigated the thermal properties of light which laid the foundation of the photon theory of light. In 1917, Einstein applied the general theory of relativity to model the structure of the universe as a whole. He was visiting the United States when Adolf Hitler came to power in 1933, and did not go back to Germany, where he had been a professor at the Berlin Academy of Sciences. He settled in the U.S., becoming a citizen in 1940. On the eve of World War II, he helped alert President Franklin D. Roosevelt that Germany might be developing an atomic weapon, and recommended that the U.S. begin similar research; this eventually led to what would become the Manhattan Project. Einstein was in support of defending the Allied forces, but largely denounced using the new discovery of nuclear fission as a weapon. Later, together with Bertrand Russell, Einstein signed the Russell–Einstein Manifesto, which highlighted the danger of nuclear weapons. Einstein was affiliated with the Institute for Advanced Study in Princeton, New Jersey, until his death in 1955. During his life Einstein published more than 300 scientific papers along with over 150 non-scientific works. 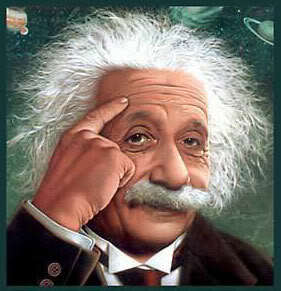 His great intelligence and originality have made the word “Einstein” synonymous with genius. In 1922, Einstein was awarded the 1921 Nobel Prize in Physics, “for his services to Theoretical Physics, and especially for his discovery of the law of the photoelectric effect”. This refers to his 1905 paper on the photoelectric effect, “On a Heuristic Viewpoint Concerning the Production and Transformation of Light”, which was well supported by the experimental evidence of that time. The presentation speech began by mentioning “his theory of relativity which had been the subject of lively debate in philosophical circles and also has astrophysical implications. Einstein also won many awards for his work, including the he Max Planck medal of the German Physical Society In 1929, for extraordinary achievements in theoretical physics. In 1936, Einstein was also awarded the Franklin Institute’s Franklin Medal for his extensive work on relativity and the photo-electric effect. The International Union of Pure and Applied Physics also named 2005 the “World Year of Physics” in commemoration of the 100th anniversary of the publication of the annus mirabilis papers. The Albert Einstein Science Park is located on the hill Telegrafenberg in Potsdam, Germany. The best known building in the park is the Einstein Tower which has a bronze bust of Einstein at the entrance. The Tower is an astrophysical observatory that was built to perform checks of Einstein’s theory of General Relativity. The Albert Einstein Memorial in central Washington, D.C. is a monumental bronze statue depicting Einstein seated with manuscript papers in hand. The statue, commissioned in 1979, is located in a grove of trees at the southwest corner of the grounds of the National Academy of Sciences on Constitution Avenue. In 1999 Time magazine named Albert Einstein the Person of the Century, ahead of Mahatma Gandhi and Franklin Roosevelt, among others. In the words of a biographer, “to the scientifically literate and the public at large, Einstein is synonymous with genius”. Also in 1999, an opinion poll of 100 leading physicists ranked Einstein the “greatest physicist ever”. A Gallup poll recorded him as the fourth most admired person of the 20th century in the U.S. In 1990, his name was added to the Walhalla temple for “laudable and distinguished Germans”, which is located east of Regensburg, in Bavaria, Germany. The United States Postal Service also honoured Einstein with a Prominent Americans series (1965–1978) 8¢ postage stamp and In 2008, Einstein was inducted into the New Jersey Hall of Fame. You’re only supposed to blow the bloody candles out! Happy Birthday to Cockney actor Michael Caine (Maurice Micklewhite), who was born 14th March, 1933 in Rotherhithe, Southwark in South East London In 1944, he passed his eleven plus exam, winning a scholarship to Hackney Downs Grocers’ School. After a year there he moved to Wilson’s Grammar School in Camberwell (now Wilson’s School in Wallington, South London), which he left at sixteen after gaining a School Certificate in six subjects. Caine’s acting career began at the age of 20 in Horsham, Sussex when he responded to an advertisement in The Stage for an assistant stage manager who would also perform small walk-on parts for the Horsham-based Westminster Repertory Company who were performed at the Carfax Electric Theatre. In July 1953 he was cast as the drunkard Hindley in the Company’s production of Wuthering Heights. He moved to the Lowestoft Repertory Company in Suffolk for a year when he was 22. It was here that he met his first wife. He has described the first nine years of his career as “really really brutal.” When his career took him to London after his provincial apprenticeship, his agent informed him that there was already a Michael Scott treading the boards in London and that he had to come up with a new name immediately. Speaking to his agent from a telephone box in Leicester Square, London, he looked around for inspiration, noted that The Caine Mutiny was being shown at the Odeon Cinema, and decided to change his name to “Michael Caine”. (Humphrey Bogart was his “screen idol” and he would later play a part originally intended for Bogart in John Huston’s film “The Man Who Would Be King”. His big break came when he was cast as Meff in James Saunders’ Cockney comedy Next Time I’ll Sing To You and was visited backstage after one performance by Stanley Baker, his co-star in A Hill In Korea, who told him about the part of a Cockney corporal in his upcoming movie Zulu, which he was producing and starring in. After dozens of minor TV roles, Caine finally entered the public eye as the upper class British Army officer Gonville Bromhead in Zulu. Caine’s agent also got him cast in the BBC production Hamlet at Elsinore (1964) as Horatio in support of Christopher Plummer’s Hamlet. Caine also starred in classic comedy crime caper The Italian Job alongside Noël Coward in 1969 and also as RAF fighter pilot Squadron Leader Canfield among the all-star cast of Battle of Britain. Caine then played the lead role in the British Gangster Film “Get Carter”. Caine then played opposite Sir Laurence Olivier in the film Slueth and his next film was The Man Who Would Be King (1975) co-starring Sean Connery and directed by John Huston. In 1976 he appeared in the screen adaptation of the Jack Higgins novel The Eagle Has Landed as Oberst (Colonel) Kurt Steiner, the commander of a Luftwaffe paratroop brigade disguised as Polish paratroopers, whose mission was to kidnap or kill the then-British Prime Minister Winston Churchill, alongside co-stars Donald Sutherland, Robert Duvall, Jenny Agutter, and Donald Pleasence. In 1978 he starred in The Silver Bears, an adaptation of Paul Erdman’s 1974 novel of the same name and was part of an all-star cast in the film “A Bridge Too Far” (1977). bythe end of the decade, he had moved to the United States, and appeared in some dreadful films like the BAFTA Award-nominated The Magus (1968), the Academy Award-nominated The Swarm (1978) and Ashanti (1979), Beyond the Poseidon Adventure (1979), The Island (1980)and The Hand (1981). He also starred with his Sleuth co-star Laurence Olivier in The Jigsaw Man and had a BAFTA-winning turn in Educating Rita (1983), and an Oscar-winning one in Hannah and Her Sisters (1986) and a Golden Globe-nominated one in Dirty Rotten Scoundrels (1988). (Ruprecht the Monkey Boy lmao). His next films were Little Voice, which won him a Golden Globe Award and The Cider House Rules (1999), which won him his second Oscar. In the 2000s, Caine appeared in Miss Congeniality, Last Orders, The Quiet American, for which he was Oscar-nominated. Several of Caine’s classic films have been remade, including The Italian Job, Get Carter, Alfie and Sleuth. In the 2007 remake of Sleuth, Caine took over the role Laurence Olivier played in the 1972 version and Jude Law played Caine’s original role. Caine also starred in Austin Powers in Goldmember as Austin’s father and in 2003 he co-starred with Robert Duvall in Secondhand Lions. He also appeared in the films Children of Men, The Prestige and Flawless, as well as starring in the British drama Is Anybody There?. in 2005, he was cast as Bruce Wayne’s butler Alfred Pennyworth in Batman Begins, Directed by Christopher Nolan, while in 2008 he reprised his role as Alfred in Nolan’s critically acclaimed Batman sequel, The Dark Knight and in the The Dark Night Rises, alongside Christian Bale, Tom Hardy and Anne Hathaway. Caine has been Oscar-nominated six times, winning his first Academy Award for the 1986 film Hannah and Her Sisters, and his second in 1999 for The Cider House Rules, in both cases as a supporting actor. He was appointed Commander of the Order of the British Empire (CBE) in the 1992 Queen’s Birthday Honours for his Contribution to Cinema, and in the 2000 New Year Honours he was knighted as Sir Maurice Micklewhite CBE. On 5 January 2011, he was made a Commander of the Ordre des Arts et des Lettres by France’s culture minister, Frédéric Mitterrand. In 2008, he was awarded the prize for Outstanding Contribution to Showbusiness at the Variety Club Awards and is one of only two actors nominated for an Academy Award for acting in every decade from the 1960s to 2000s, the other being Jack Nicholson. English comedian, actor, television presenter and personality.Jasper Carrott OBE (Robert Norman Davis was born in Acocks Green, Birmingham, England on 14 March 1945. In February 1969 he started his own folk club, “The Boggery”, in nearby Solihull with his friend Les Ward. Here, Carrott performed folk songs and MC duties. Before long, his banter with the audience overtook the actual songs; he became known more as a comedian than a singer. He toured the UK, appearing in rugby clubs. He independently recorded an album, financed by himself, called Jasper Carrot – In the Club, which he sold from the back of his van. It was this album that contained the original “Magic Roundabout”. Released in 1973, the LP is quite rare, although it mainly consists of material later used in his first three official LPs (such as “Hare Krishna”, “Car Insurance”, “Bastity Chelt”, and “Hava Nagila”) plus the Fred Wedlock song “The Folker”. He had a surprise UK Top 5 chart hit in August 1975 with the novelty record “Funky Moped”, written by Chris Rohmann and produced by Jeff Lynne. The B-side of this single was a risqué monologue parodying the animated children’s TV series The Magic Roundabout. This track was banned by the BBC, which is widely believed to have contributed to the single’s commercial success, which in turn, ironically, led to his appearance on the BBC’s Top of the Pops. By the late 1970s, Carrott had developed a number of anecdotal sketches which he still performs in similar form some thirty years on. Often these sketches purported to be auto-biographical; many of them celebrate Birmingham accent and culture, including his support of his beloved Birmingham City.His sketches were captured on records such as Jasper Carrott Rabbitts on and on and on… and Carrott in Notts which were recordings of live performances. Notable hits were “Bastity Chelt” a complete song in Spoonerism, “The Football Match” describing a visit to Old Trafford, “The Nutter on the Bus” including the well known cry of “Has anybody seen my camel?”), “The Mole” (“There’s only one way to get rid of a mole – blow its bloody head off!”) and “Zits” – an explanation of an American slang word for spots that brought the word into use in England In 1979 he published A Little Zit on the Side, which purported to be a humorous autobiography. The follow-up, Sweet and Sour Labrador, mixed sections of his stand-up routines with similar autobiographical material, much of it related to his world travels. His first appearance on television was a half hour show for BBC Midlands on August 11th 1975 in a programme about local football called “The Golden Game”. Then in 1976, A Half Hour Mislaid with Jasper Carrott recorded at Pebble Mill. His big break came two years later when he was invited by Michael Grade to make a pilot for LWT. It was well liked by Grade; a five further shows were recorded and became his first TV series, An Audience with Jasper Carrott, in 1978, this successful partnership with LWT lasted until 1981, The Unrecorded Jasper Carrott (1979) and Beat the Carrott (1981) are the two best known live stand-up performances from his time with LWT. This was followed by a move to the BBC and Carrott’s Lib – a Saturday night comedy show broadcast live – and then by a string of BBC shows. The most notable of these were Carrott’s Commercial Breakdown, which broadcast weird and wonderful adverts from around the world, and the sketch and stand-up shows Carrott Confidential, 24 Carrott Gold, The Jasper Carrott Trial and Canned Carrott, some of which also gave TV exposure to the comedy partnership of Steve Punt and Hugh Dennis. In addition to his television work, Carrott made a foray into cinema, when he played Heinrich in the 1987 British comedy Jane and the Lost City.Canned Carrott also featured a regular police drama spoof called The Detectives, co-starring Robert Powell, which was spun off into its own series. In 2002–2004, he starred in the sitcom All About Me. He performed in several of the Secret Policeman’s Ball charity concerts for Amnesty International, and returned to the stage in 2004 for several sell out shows at the National Indoor Arena in Birmingham featuring classic routines from his career. He returned to a singing role for the musical Go Play Up Your Own End (written by Malcolm Stent, songs by Harvey Andrews).In 2005, he appeared in and put on the first of Jasper Carrott’s Rock With Laughter concerts. He appeared alongside performers such as Bill Bailey, Bonnie Tyler, Lenny Henry, Bobby Davro, the Lord of the Dance troupe and Bev Bevan. This has become a regular event at the NEC in Birmingham, usually staged in December and some times alternating with his “Jasper Carrott’s Christmas Crackers” events, but there have also been a few summer shows too. Jasper also was one of the comperes for the Birmingham Heart Beat Charity Concert 1986, which featured many local bands such as Electric Light Orchestra and the Moody Blues, with a finale that included George Harrison from the Beatles.On 15 September 2007 he was inducted into the Birmingham Walk of Stars at a presentation as part of the Arts Fest 2007 celebrations. The award was presented by the Lord Mayor of Birmingham. Carrott is the second inductee, following Ozzy Osbourne.Jasper Carrott was awarded the Lifetime Achievement Award by the British Comedy Awards on 6 December 2008. In the summer of 2007, Jasper hosted the Endemol-produced game show Golden Balls for ITV1. Promising ratings led to a recommission, and the second series began in January 2008. A third series began in April 2008, and a fourth series started in October 2008. A fifth and six series were shown in 2009.He was the host of the Sunday night interactive national pub quiz, Cash Inn, and also an investor in the company, operated by Innterplay. This company has since entered administration.He was 20th in Channel 4′s 100 Greatest Stand-Up Comedians show.